Anna Campbell made her romance debut with quite the splash in 2007, with the release of Claiming the Courtesan. It was a book that stirred up quite a bit of controversy, a lot of discussion about returning to old school tropes of forced seduction, etc. 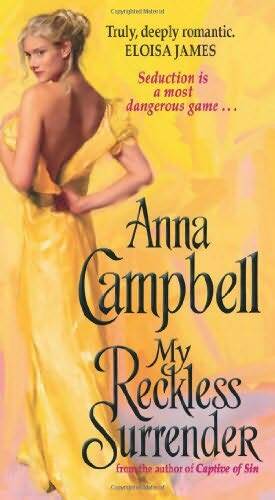 She has published several books since, but I never got around to picking up a Campbell book until now — her most recent release, My Reckless Surrender. Desperate “country widow” Diana Carrick is on a mission to seduce notorious rake Tarquin Vale…and what ensues is the love story of two people who turn out to be more than just those snap assumptions. Because of the nature of the plot, and the conflict that builds between the characters, I felt like the obligatory Happily Ever After was rushed. The book could have used about 100 more pages of conflict and conflict resolution before the “I love you”s and “Marry me”s that always cap off a romance novel. And that sense stems mostly from the fact that the reader spends so much time with Diana and Tarquin that the tale begs for more! I don’t know that I’ve noticed this with other authors, or if Campbell does it in her other books, but I’d say 85-90% of this book features only Diana and Tarquin. That fascinated me. No obligatory balls, no twenty earls and dukes to learn the names of. Campbell strips away the frills; most of the development takes place in Diana and Tarquin’s hideaway love nest. So the reader becomes entirely entrenched in their emotional push-pull. In Tarquin falling in love with this mysterious woman, in a conflicted Diana trying to play the worldly seductress but really just revealing how untutored she is. So the ending is too easy for all that, you know? You want to continue suffering and learning with these characters, and want their resolution to be just as drawn out as the process of them falling in love! I’m definitely piqued by the intimate, one-on-one nature of Campbell’s narrative, and will be making my way through her backlist.